Published in Rafu Shimpo, March 17, 1969, English and Japanese sections. 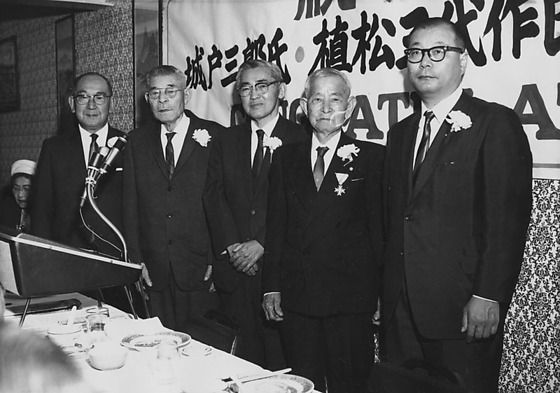 Recognition banquet, or Shukuga kai, honoring three recipients of the Order of the Sacred Treasure, or Kunsho (medal) awards from the Japanese government, Mr. Miyosaku Uyematsu, Mr. Saburo Kido and Mr. Eizo Maruyama, held at San Kwo Low restaurant in Little Tokyo, Los Angeles, California, March 15, 1969. 1P and 2N: Five Japanese men in suits with white carnation boutonnieres stand at head table in front of a banner in Japanese and English next to podium with microphone. Busy wallpaper in background. They are identified (left to right): Takito Yamaguma of Bank of Tokyo, Maruyama, Shin Nichi Bei publisher Kido, Uyematsu, and Consul General of Japan Sadao Saito. 3N: Men and women sitting at head table covered with dishes of food. People eating and drinking. Banner in Japanese and English hangs on wall behind them. Typed on original negative envelope: Uyematsu, Kido, Maruyama -- Shukuga Kai at San Kow Low. Kido received the 4th Order of the Sacred Treasure and Uyematsu and Maruyama received 6th Order. Kido, a Hawaii-born attorney, was involved with the JACL. Uyematsu operated a nursery in Montebello and donated cherry blossom trees to Griffith Park.